When people think of Los Angeles, they think of glitz and glamour, expensive cars, palatial McMansions, beaches and sunshine. 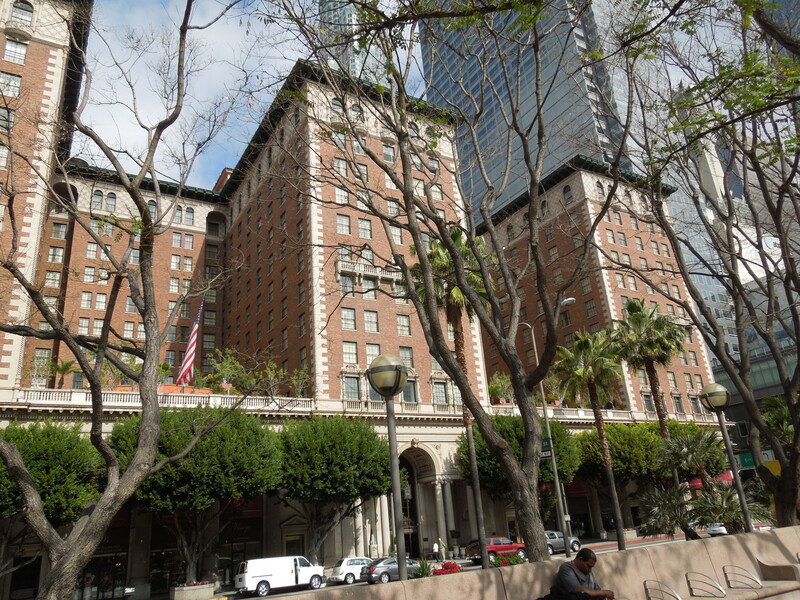 But rarely do they think “historical.” In fact, there’s a surprising amount of history here in LA. 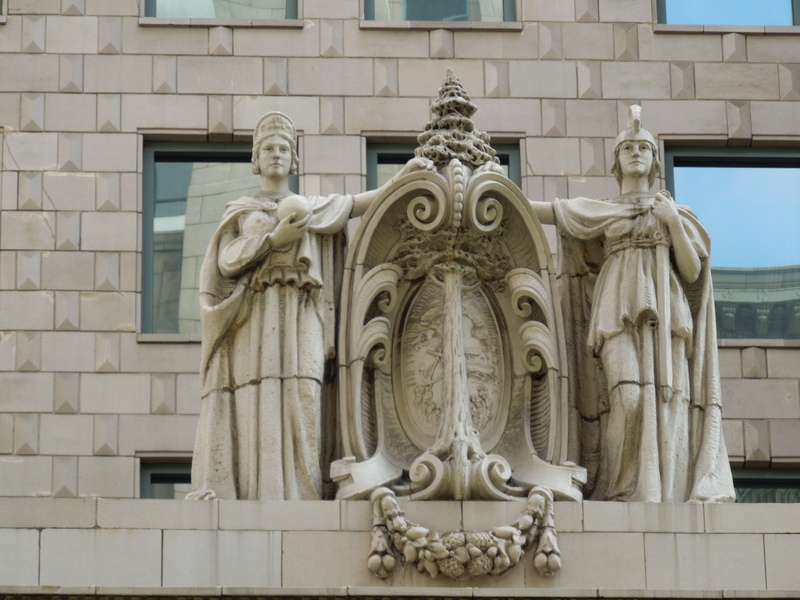 The city was being built up quite rapidly in the late nineteenth and early twentieth centuries, and the result is a city of hidden Beaux Arts, Modern, and Art Deco treasures. 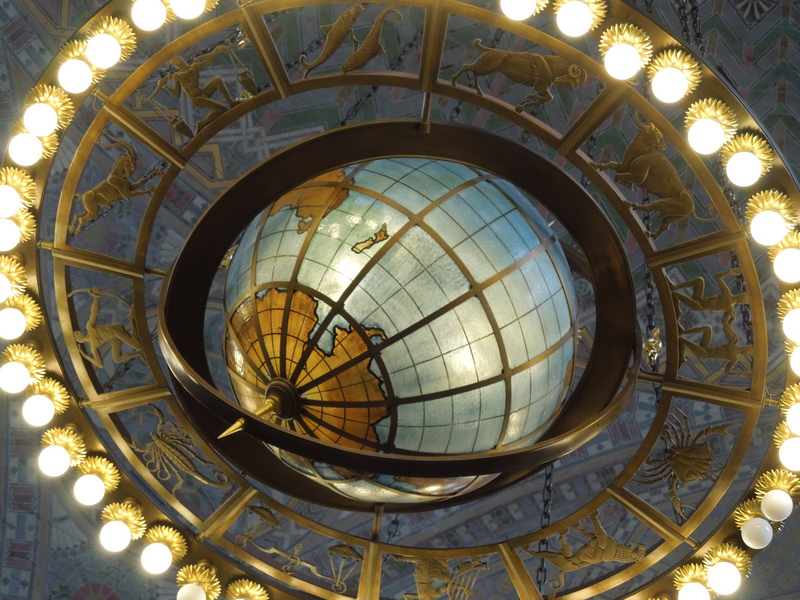 This past weekend the hubby joined me on an LA Conservancy tour I have been meaning to take for quite some time, and I’m so glad we finally went. 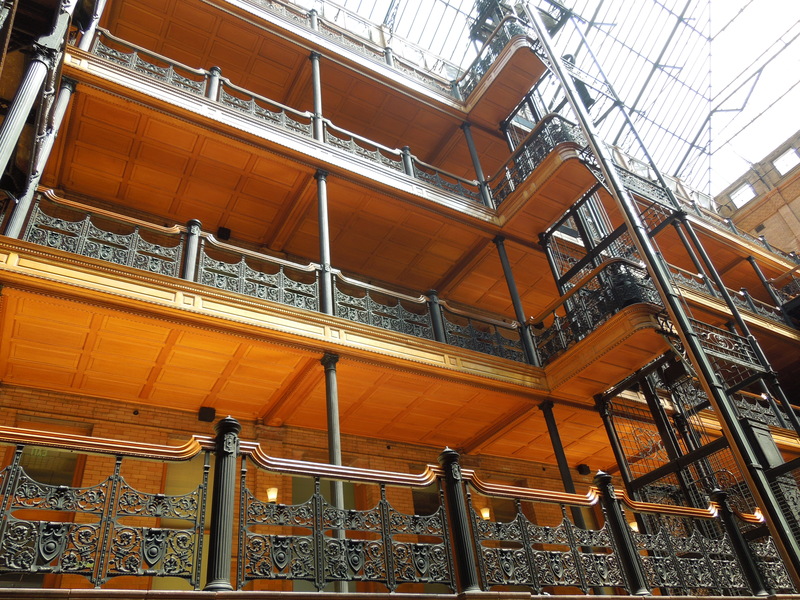 It was a walking tour, close to two and a half hours, that took us through some of LA’s greatest architectural achievements, ending in a finale of sorts at the Bradbury building, considered LA’s single most important work of architecture. Here are my favorite highlights of the tour. 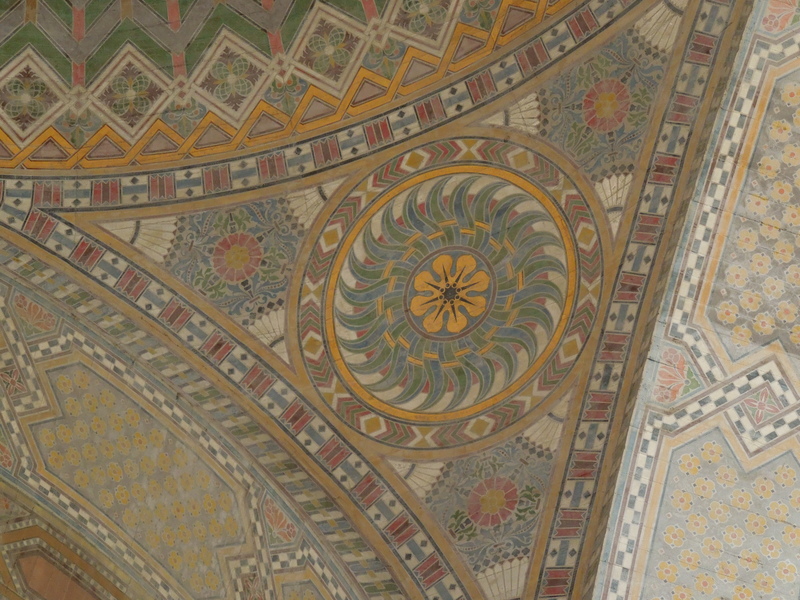 If you are in the LA area, I highly recommend you take one of the conservancy’s tours on your own. They have a bunch to choose from. I personally plan to hit as many as I can over the coming year. 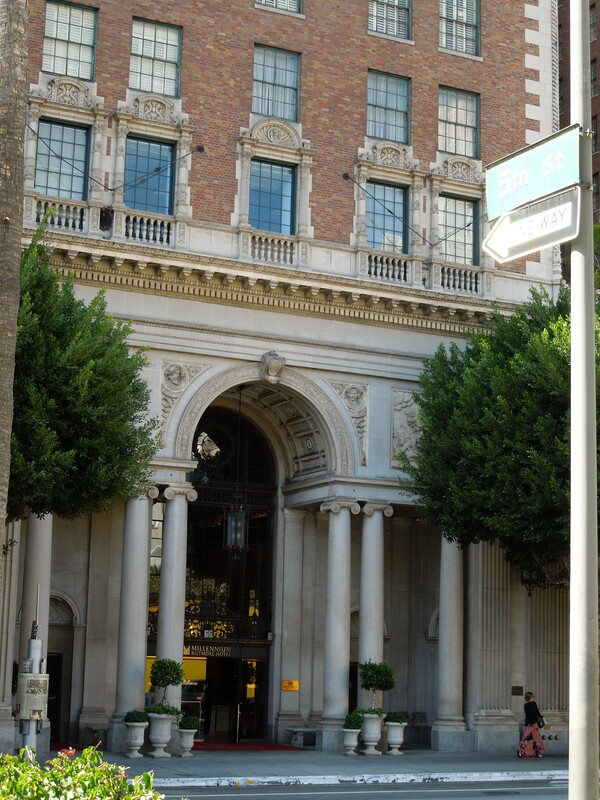 The Biltmore Hotel (not actually associated with the national Biltmore you may have heard of, but using the same name nonetheless) is a pretty perfect example of Beaux Arts architecture. 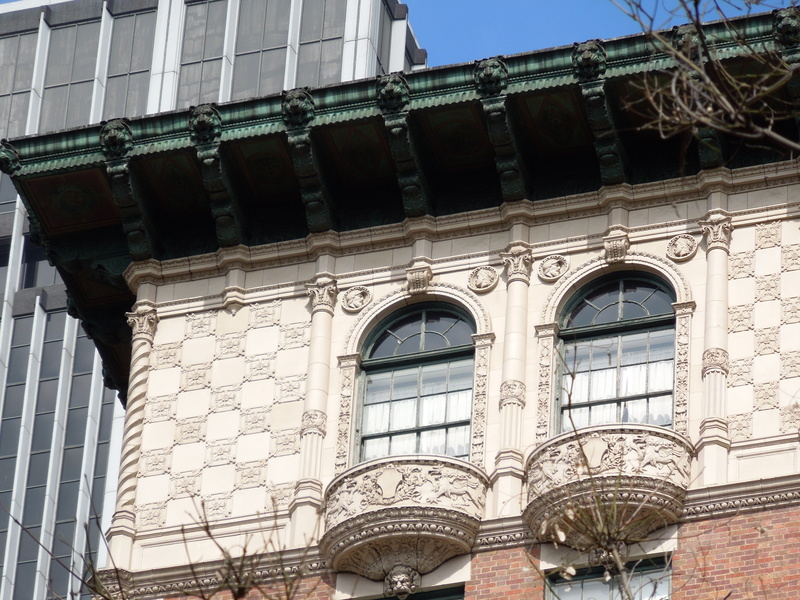 With it’s columns and ornamentation at the base floors of the building and ornamentation at the very top, the architects left the majority of the center of the structure relatively simple, as is typical for Beaux Arts design. 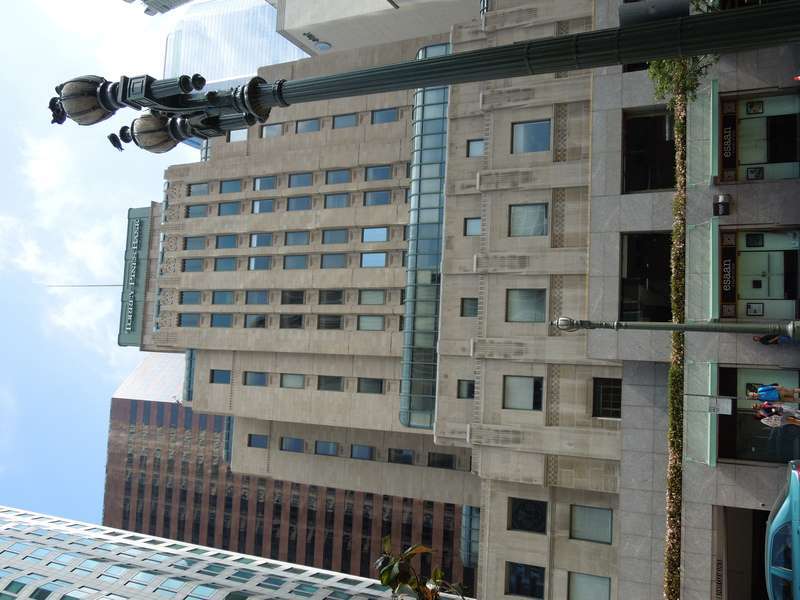 To me, this looks just like buildings you might see in a city like New York or Chicago. The Biltmore is a gorgeous hotel, and they even offer a traditional afternoon tea for a truly Victorian experience. 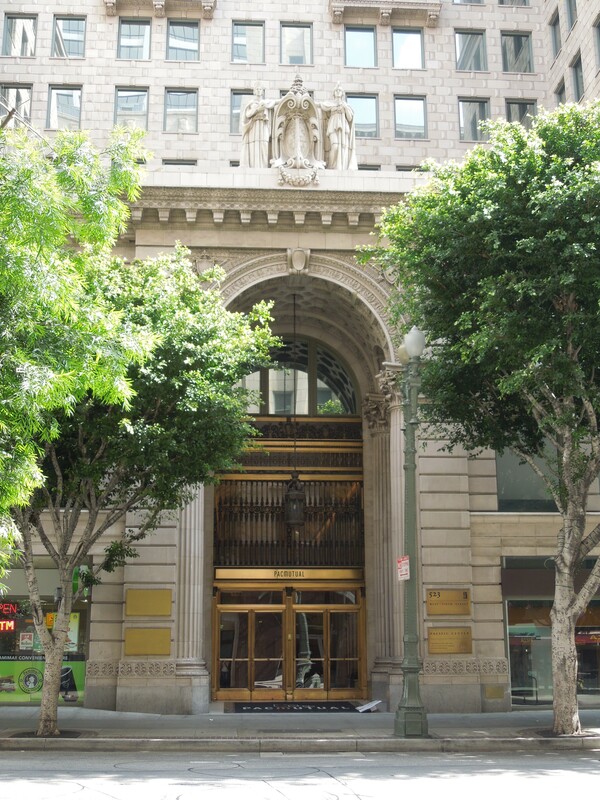 This building was originally built when Pacmutual was still the Pacific Mutual Life Insurance Company. 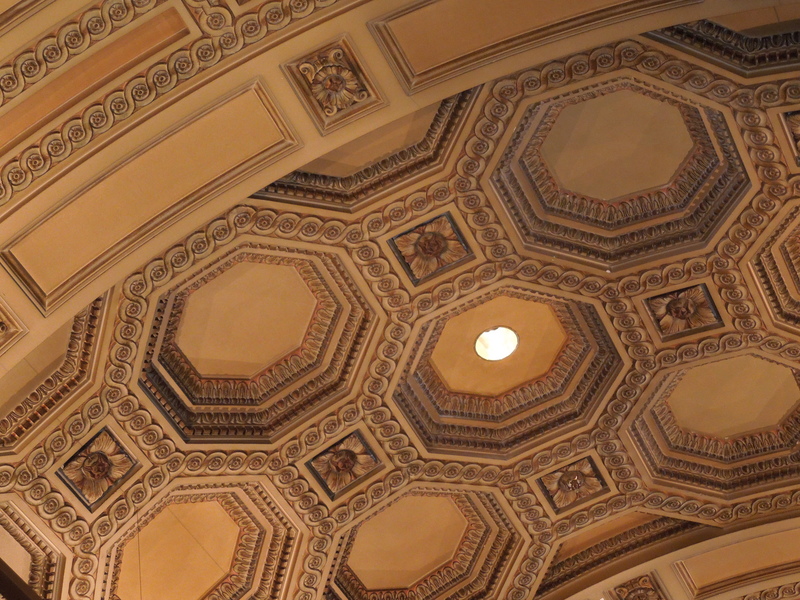 Also in the Beaux Arts style, the ornamentation pattern is similar to the Biltmore. 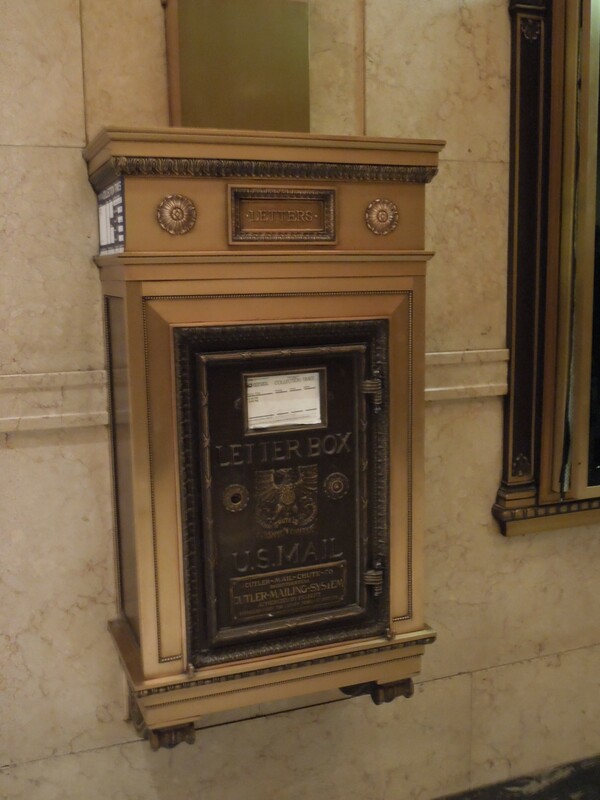 The building still holds most of it’s original charm and decorative detailing, making you feel like you have stepped into another time altogether while you wander through the lobby. 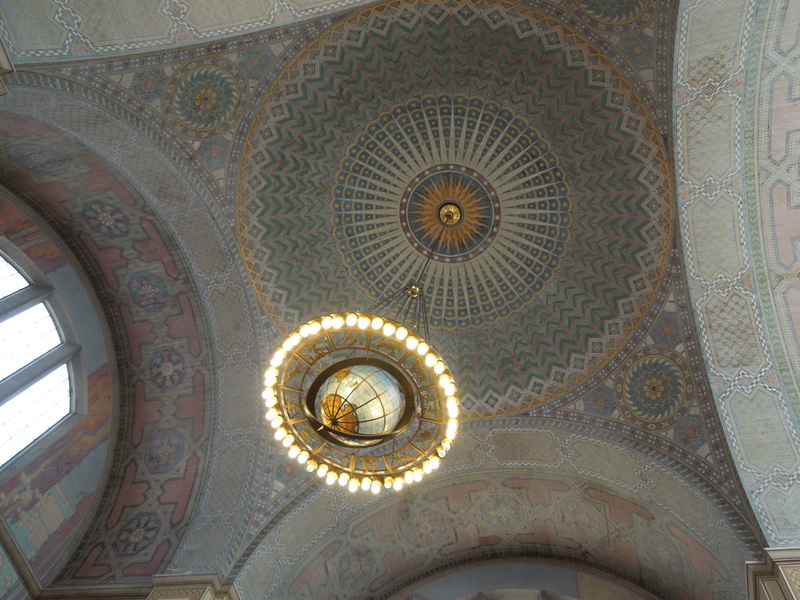 The library is one of those places I have always loved and appreciated. 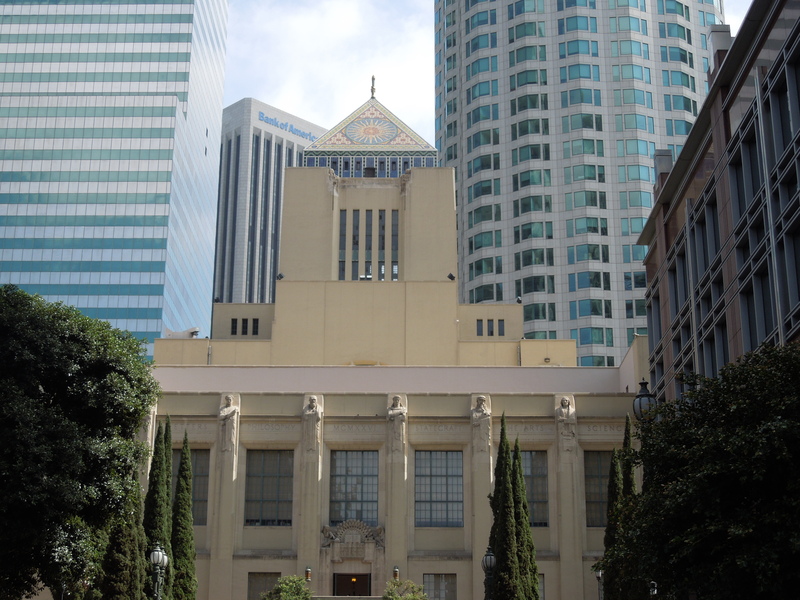 Sadly, we’re no longer technically City of Los Angeles residents, so no more checking out books from this magical place! 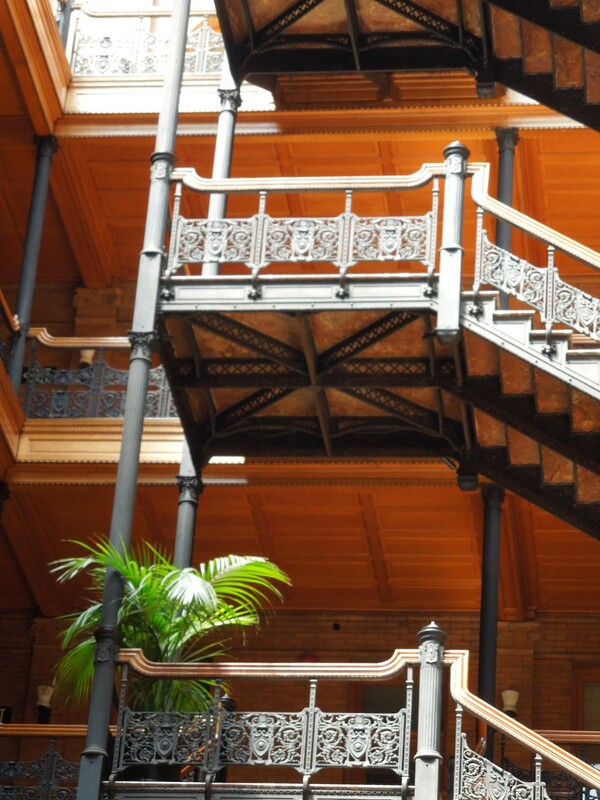 But it’s still a public building, so anyone can visit. 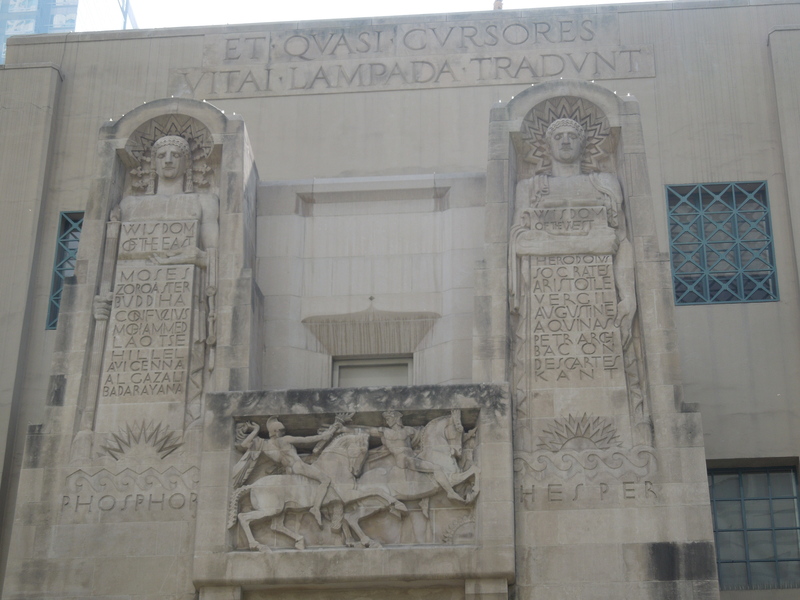 Although the architect refused to admit to building in any particular style, the library was built during the beginnings of the popularity of Art Deco, and it shows. 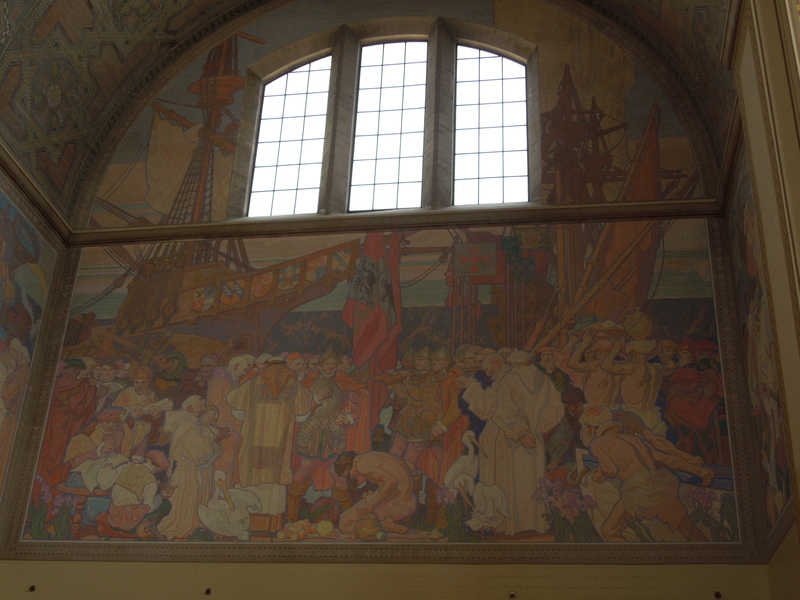 He had also just returned from a trip to Turkey, and the tile work and murals throughout clearly reflect that influence. 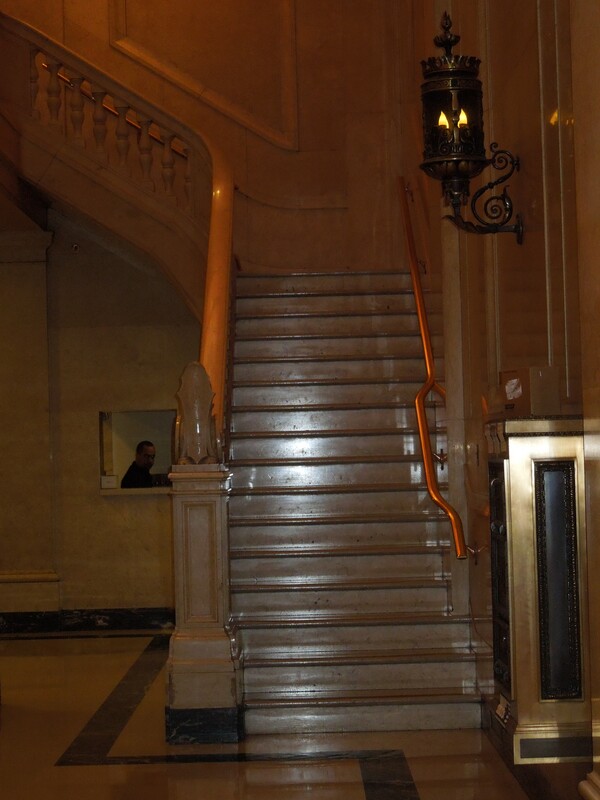 This is another Art Deco treasure that makes you feel as though you have entered another era when you walk inside. 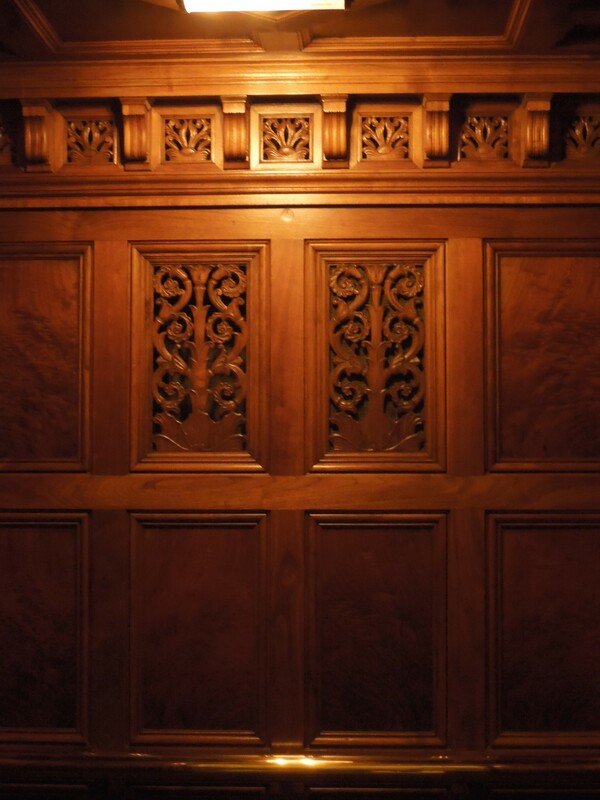 The lobby boasts an incredible amount of beautiful marble work and lots of original details including carved wood elevator interiors and inset ornamentations on the ceiling. 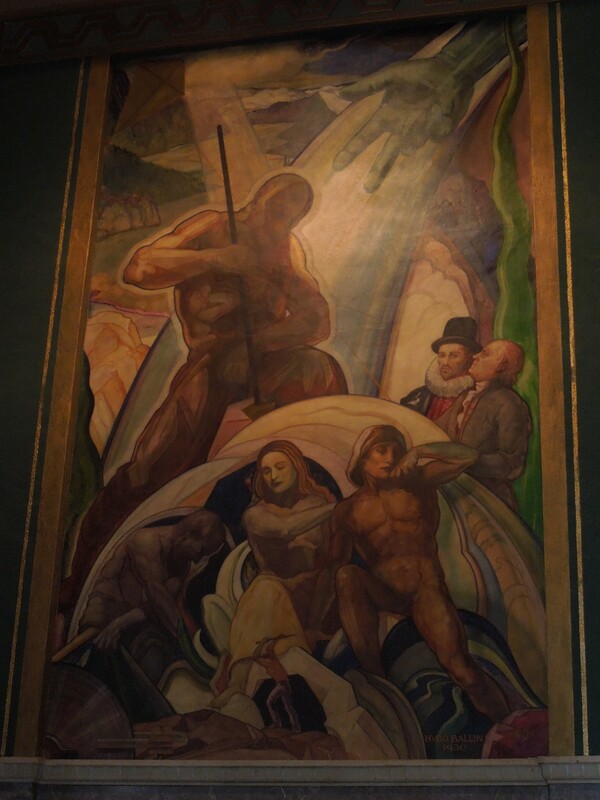 Plus, there is a mural painted by Hugo Ballin, the same artists who painted the amazing murals in the rotunda at the Griffith Observatory. 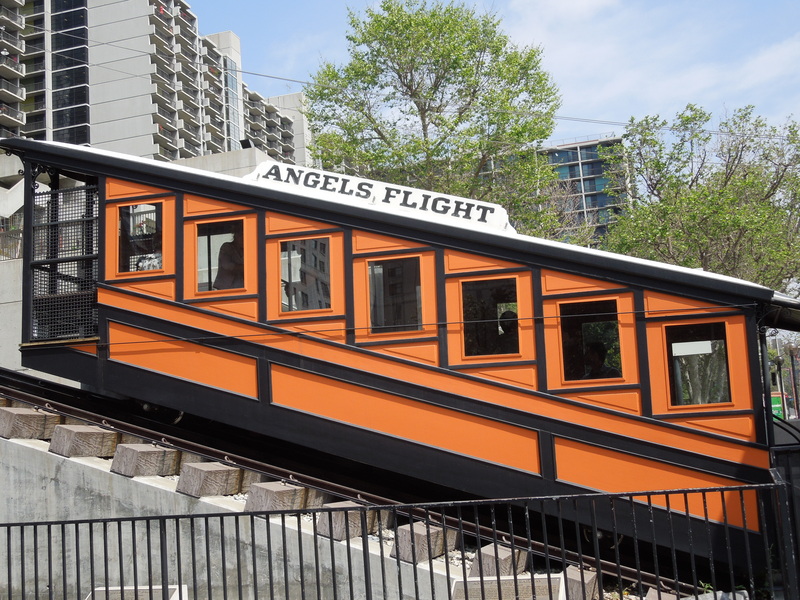 Angel’s Flight was recently re-opened to the public, and is a treasured piece of Los Angeles history. 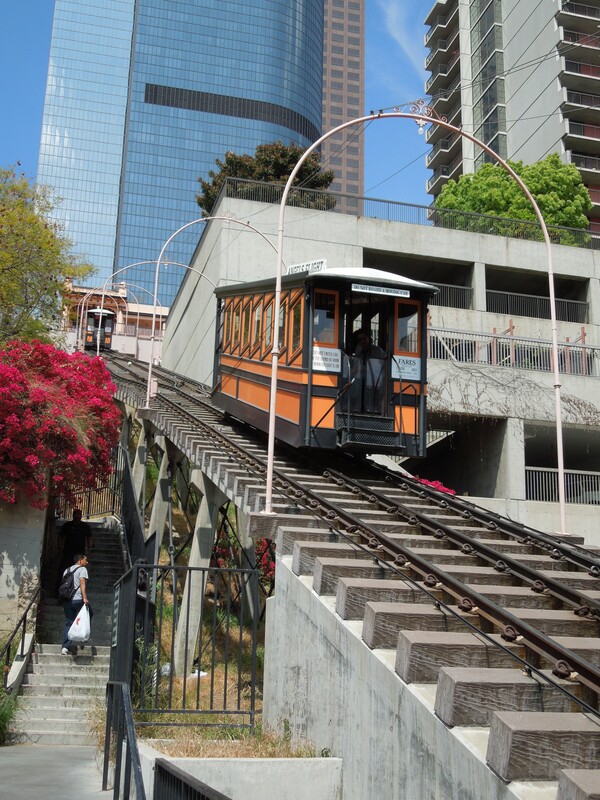 It was originally intended as transportation for the residents of the exclusive Bunker Hill (now populated by skyscrapers and performance theaters, and no longer residential) so that they could easily go from the top of the hill to the bottom. 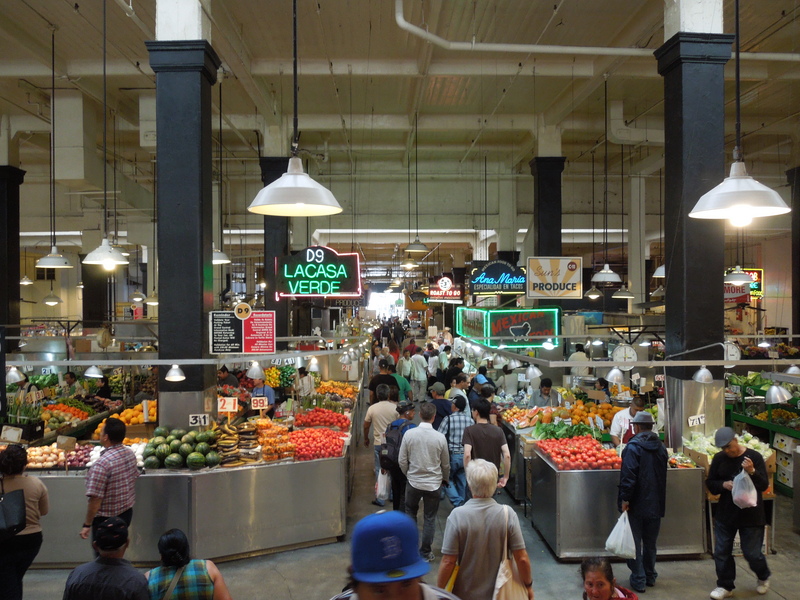 At the base of Angel’s Flight is Grand Central Market, which was bustling with activity just like I imagine it has since it opened in 1917! 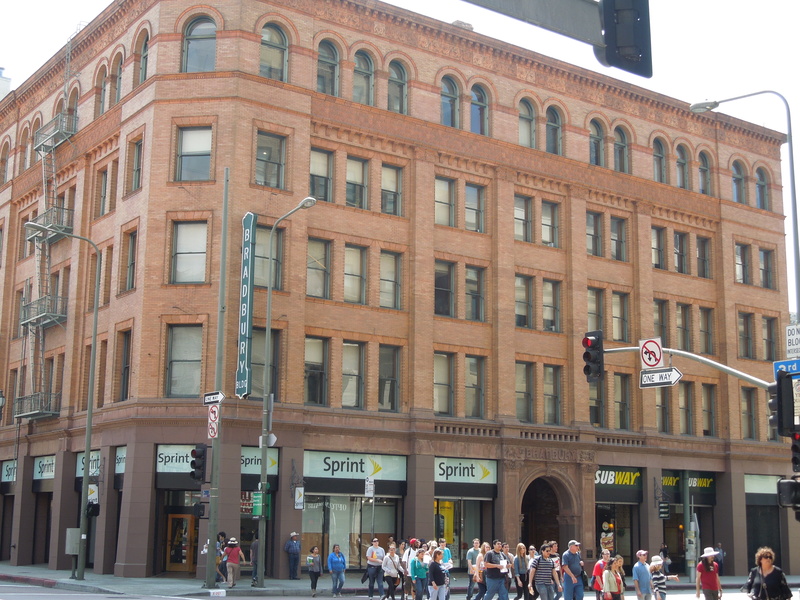 This was the building we all had been anxiously awaiting our arrival to. 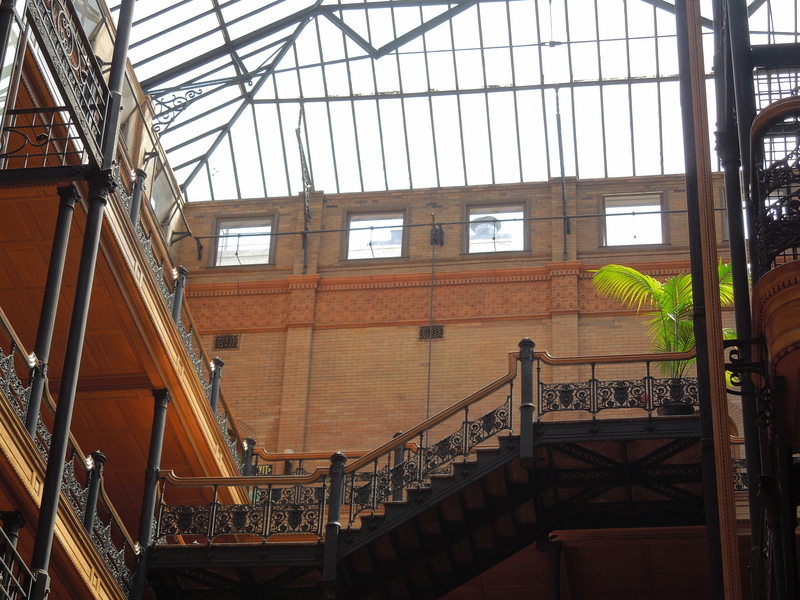 You may recognize this one from movies such as Blade Runner and 500 Days of Summer, among many others. 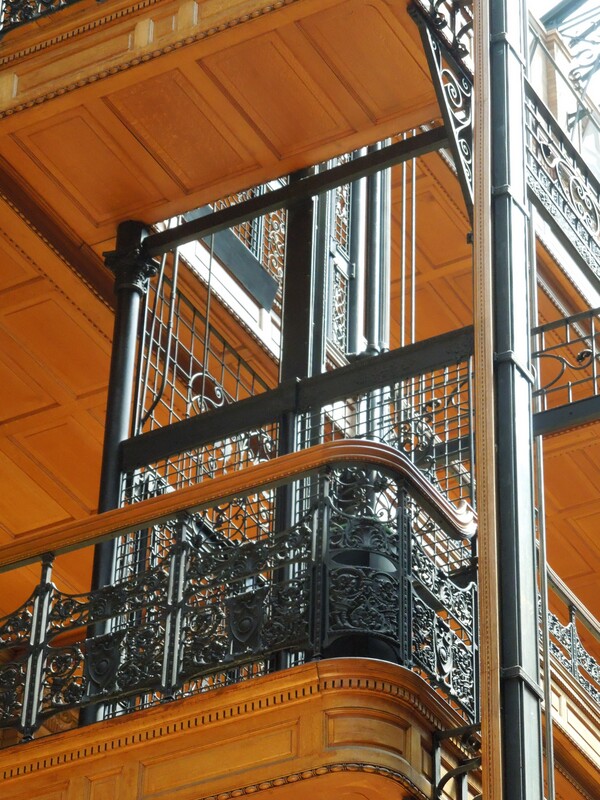 The Bradbury Building doesn’t look like much from the outside, but is an incredible feat of architecture on the inside! 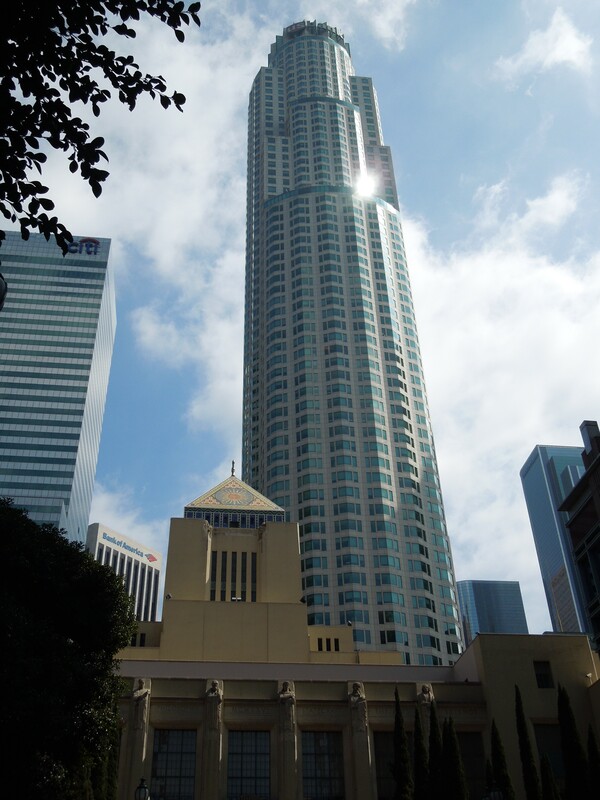 No one actually knows exactly who the architect was, but Lewis L Bradbury commissioned it at the end of his life so that he may leave a legacy to Los Angeles. He never saw it in it’s finished form, but it certainly is a legacy. 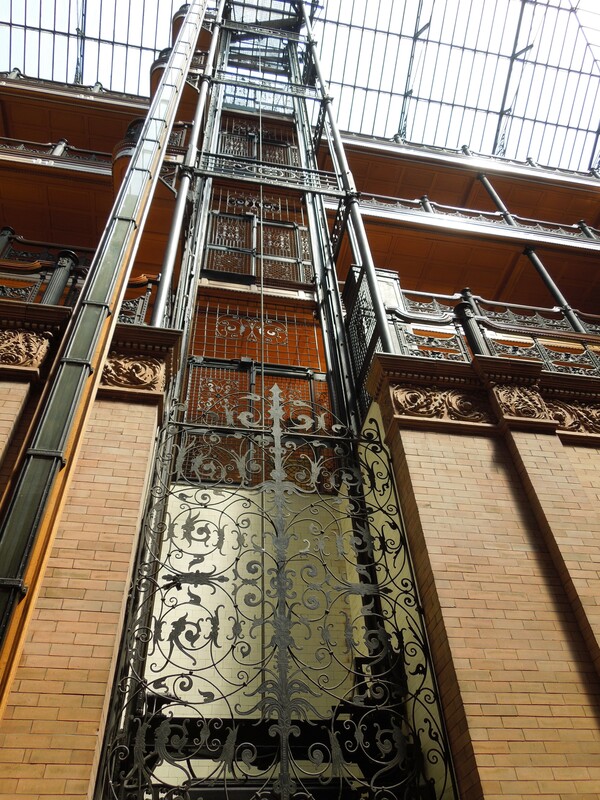 The glass ceiling allows light to travel into nearly every corner of the building, and incredible iron work and wood panelling details cover the space unlike any other place I’ve ever seen. 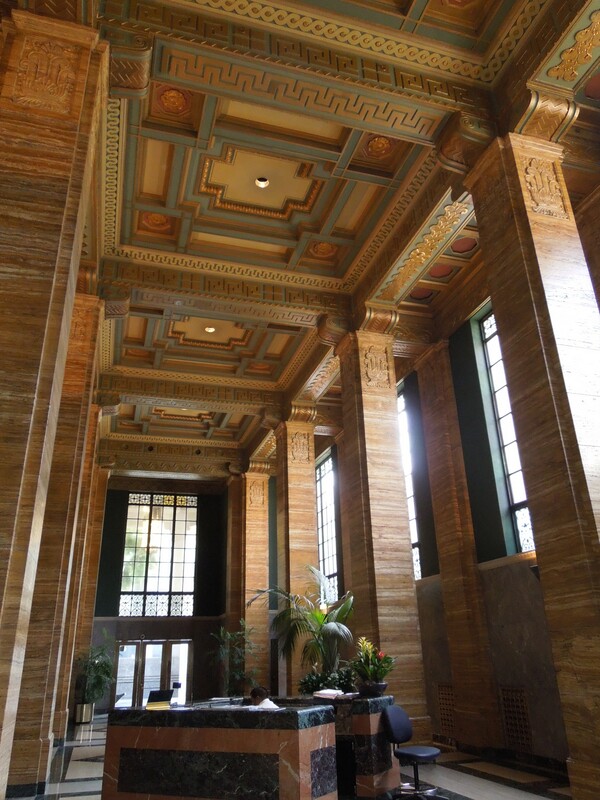 I’m hoping to jump on LA Conservancy’s Art Deco tour next, but there are so many to choose from! 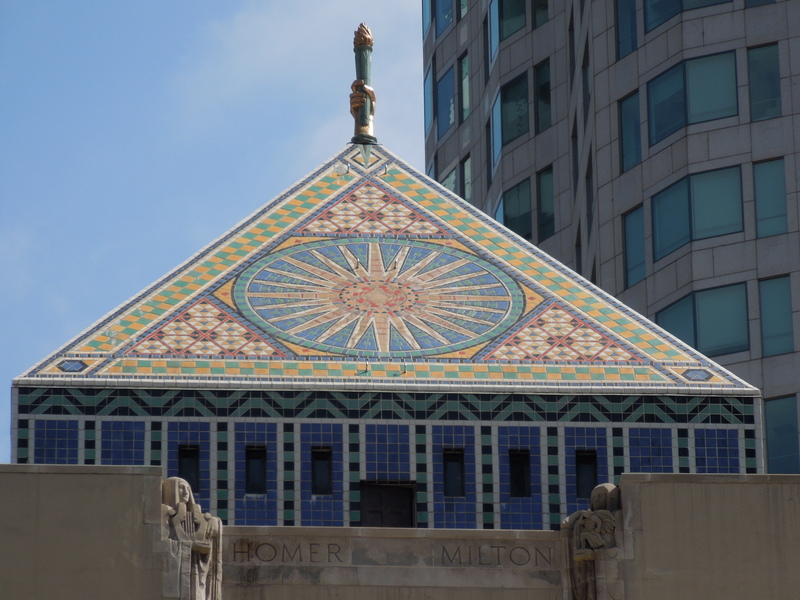 Do you have a favorite LA architecture gem? 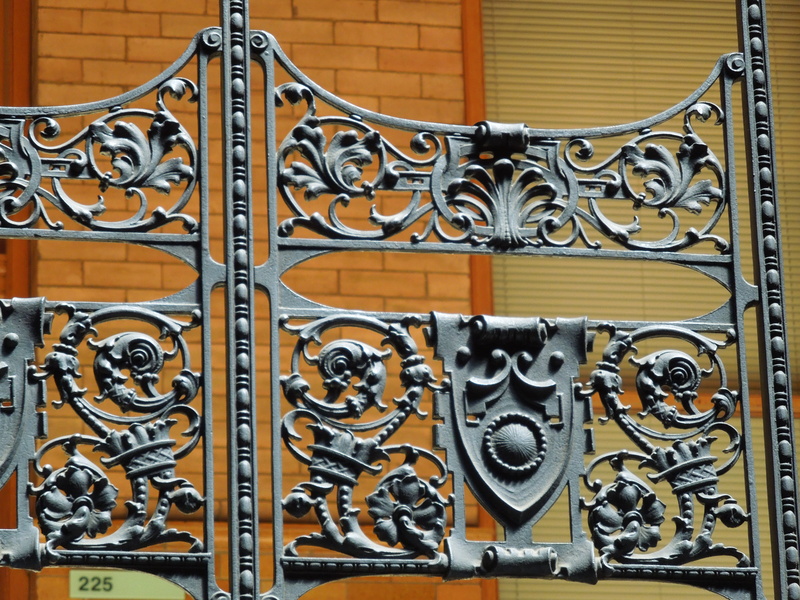 Or a favorite from your own city?